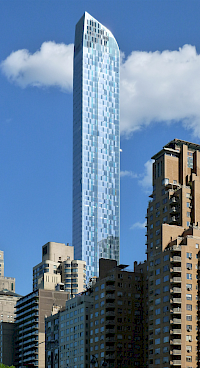 1 New York Place was a supertall skyscraper that was proposed in 2002 to rise 1,050 feet (320 m) tall and have 90 floors. The tower was supposed to be located in New York City's financial district at Broadway and Fulton Street, but the project was canceled. 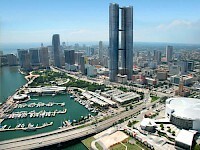 The tower was designed by Kohn Pedersen Fox and projected to cost USD $680 million. It would have had 1.3 million square feet (121,000 square meter) of floor space. 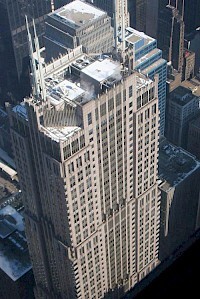 The New York Times Building is a skyscraper on the west side of Midtown Manhattan that was completed in 2007. Its chief tenant is The New York Times Company, publisher of the The New York Times, The Boston Globe, the International Herald Tribune, as well as other regional papers. Construction was a joint venture of The Times Company, Forest City Ratner Companies—the Cleveland-based real estate firm redeveloping the Brooklyn Atlantic rail yards—and ING Real Estate. 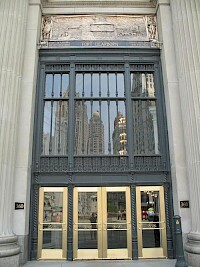 The London Guarantee Building, formerly known as the Stone Container Building, is a historic building located in the Loop community area of Chicago, Illinois. It is known as one of the four 1920s flanks of the Michigan Avenue Bridge (along with the Wrigley Building, Tribune Tower and 333 North Michigan Avenue). 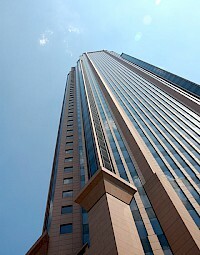 It stands on part of the former site of Fort Dearborn. 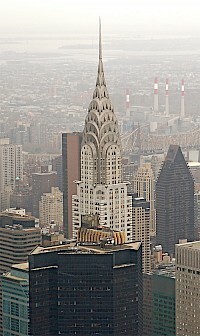 It was designated a Chicago Landmark on April 16, 1996. 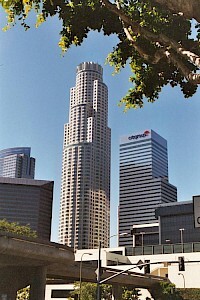 In 2001, the building was acquired by Crain Communications Inc.
U.S. Bank Tower, formerly Library Tower and First Interstate Bank World Center, is a 310.3 m (1,018 ft) skyscraper at 633 West Fifth Street in downtown Los Angeles, California. 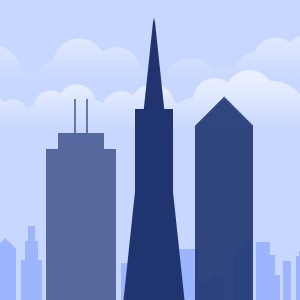 It is the tallest building in the state, the tenth-tallest in the United States, the tallest west of the Mississippi River, and as of December 2009, the 40th tallest building in the world.